The Hereford Junior team achieved convincing wins at the last session of NJL at Bristol to finish as Champions again. Another successful outing for Herefordshire's National Junior League team. Hereford Challengers had a brilliant final weekend in the Veterans British Table Tennis League at Derby Arena. They finished 5 points clear of the second placed team to gain promotion to the first division. 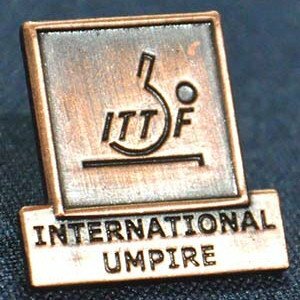 Congratulations to Hereford's Harry Jutle who has gained his Blue Badge, the highest International Umpire award. The Hereford team continued in fine form in the second round of the NJL held at Bristol. Hereford League table tennis player Kyle Day recently competed at the East Midlands 4 star tournament in Wellingborough. This is the highest level of open national tournament in England for Cadets and Juniors. The Bishop of Hereford Bluecoat School table tennis team had a successful competition at the English Schools Association zone finals. I am very saddened to have to inform players that Dave White lost his battle against brain cancer on 10th December 2016. Our deepest sympathy goes to his wife and sons. Dave's funeral will be held at 2pm on Friday January 6th at Worcester Crematorium. Family flowers only please.